Woven potholder, Las Vegas lighter holder, tweezers, frayed rope, framed photograph. Woven wicker plate holder, Harley Davidson t-shirt, meal studs, dyed spanish moss (tillandsia usneoides), glass jar, blood, hair. Wood from Oscar's house, red danger barricade tape, american flag patch, melted birthday candles, upholstery foam, epiphytic bromeliad. 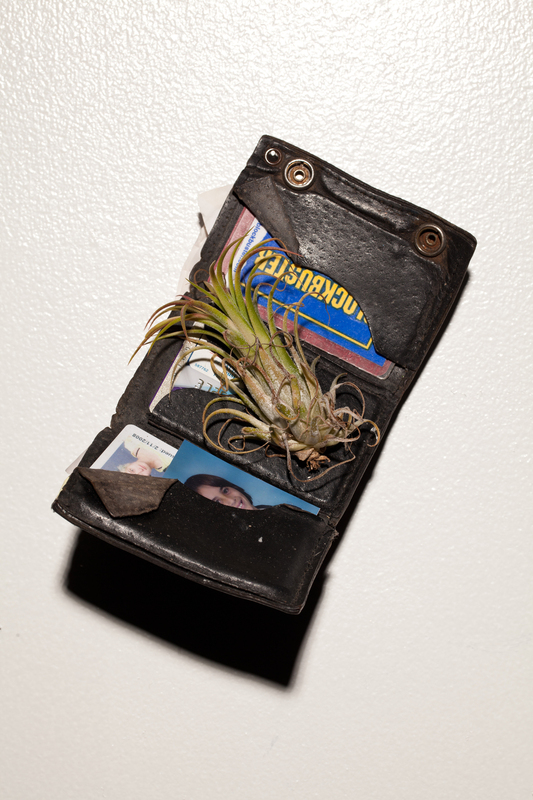 Father's wallet, 2008 student ID, brother's portrait, American Express card, Fedex Kinkos card, Borders Books card, Blockbuster card, receipts, epiphytic bromeliad. Louis Vuitton handbag (Murakami, 2003), epiphytic bromeliads, water. 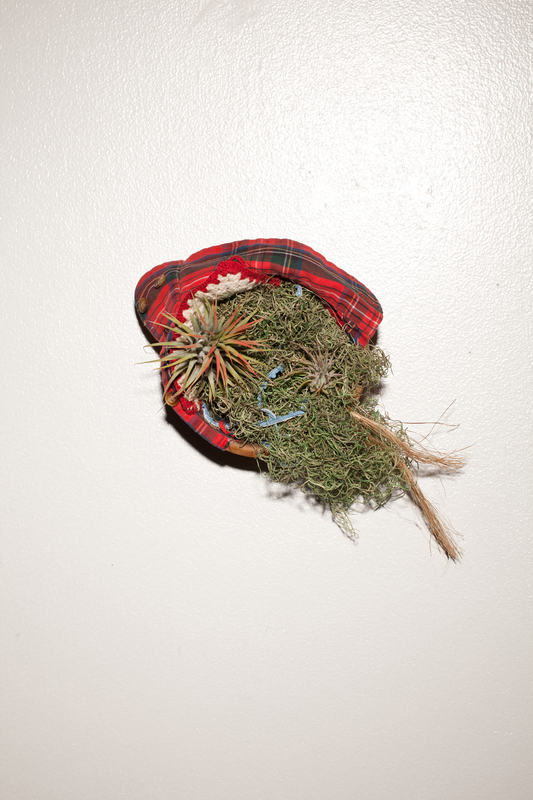 Red flannel sleeve cut from Emily Stebbin's shirt in 2005, woven pot holder, wooden bowl, spanish moss, epiphytic bromeliads, water, blue embroidery. T-shirt, embroidered napkin, dyed spanish moss, denim, zipper, brown thread, polyester stuffing. 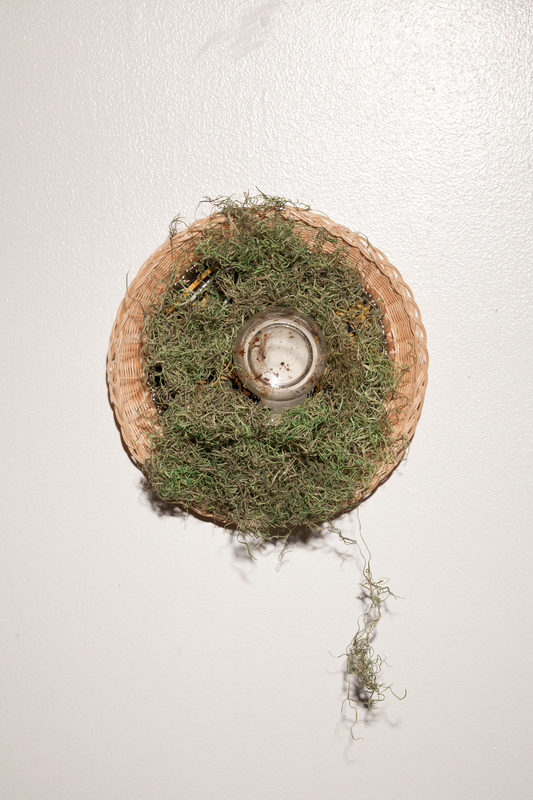 Woven wicker plate holder, glass window decoration, altered United States Flag, moss, epiphytic bromeliad (tillandsia fasciculata), ball-moss (tillandsia recurvata) tree branch, water. Wood, orange plastic fence, epiphytic bromeliad (tillandsia fasciculata), water. Altered Florida State Flag, acrylic paint, blue lace from my mother's childhood ballet costume.